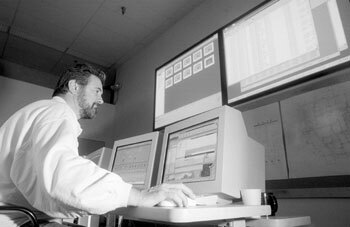 Howard Trent, a senior engineer with technical services, monitors computers in the operations control center. 11 July 2001 | Small, inexpensive sensors developed at Berkeley to monitor and help control energy consumption are being put to work to save electricity, gas and water automatically in campus buildings. Engineering researchers have teamed up with physical plant engineers to put these breakthrough technologies in place to operate several campus energy systems, with the future potential for doing more. The wireless “smart dust” sensors can measure a building’s temperature, effluent discharge, and power supply, and even capture weather data, irrigation needs or monitor Strawberry Creek’s pH and salinity levels, according to physical plant technicians. A product of Berkeley’s proposed Center for Information Technology Research in the Interest of Society, CITRIS, these automated sensor networks will be installed in buildings and underground systems across campus in the next several years. When fully deployed, the sensors could reduce Berkeley’s energy bill by nearly $900,000 a year, say engineering researchers. Initially, the sensors will be used to measure pressure in portions of the campus steam system, as well as light and temperature levels in classrooms, offices, labs and hallways. Eventually, says Trent, the sensors will deliver data to actuators, which will automatically adjust heating and cooling systems or switch power on or off to conserve energy. Researchers from the College of Engineering have already equipped portions of Cory Hall with sensors that perform those functions. And the technology is inexpensive: with further development, says College of Engineering Dean Richard Newton, each sensor will cost less than a dollar. “Eventually, we want to make sensors so small and inexpensive you could put thousands of them into a can of paint and brush them onto a piece of infrastructure,” said Newton. Smart dust developer Kris Pister, an associate professor in Electrical Engineering and Computer Sciences, and other engineering professors are working with Physical Plant – Campus Services technicians and engineers to develop, integrate and distribute the sensors across campus. Commercial companies interested in moving this cost-effective technology to the private sector are also providing support. Smart dust will work in conjunction with a newly acquired software system — Supervisory Control and Data Acquisition, or SCADA — that remotely monitors and controls portions of the campus’s infrastructure. SCADA is housed in a newly created Operations Control Center at 2000 Carleton St. From here, engineers can oversee virtually every facet of the university’s utilities and route valuable information to building managers or the UC Police Department in the event of a crisis or malfunction. Even without smart dust fully deployed, SCADA provides tremendous support in overseeing campus utilities, Trent said. Durng a power outage, for example, engineers can pull up the campus’s power grid on one of six computer monitors at the control center, zoom in on the problem area, then click on it to view the electrical drawings for that spot. Using this information, field crews can reroute electricity and restore power — in some cases remotely — within minutes. In the past, Trent said, restoring power often took several hours. Nearly 30 percent of the campus’s irrigation system is being operated remotely using SCADA, which will save man-hours and thousands of gallons of water every year.